Hello and welcome!! I am excited to be joining the Lil' Inker Designs new Color Team for this super fun release today! If you are following the blog hop, and you'll want to because there are prizes involved, you should have come from Laura Nehring's blog! If you would like to start at the beginning, be sure to visit the Lil' Inker blog! I was able to design with the cutest little owl set (you know I love owls, right?)! 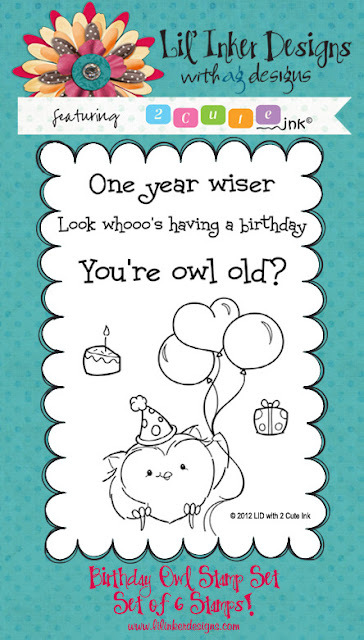 It is called Birthday Owl and is already for purchase in the Lil' Inker Designs store along with several other new stamp sets that the Color Team will be debuting all week! I decided my owl needed to be pink! I cut the balloons out of patterned paper & popped them up with pop dots, added glittered stickles to the polka dotted hat and glued a small pom pom on top. Just a little bit of dimension goes a long way. That pink and white stripe at the bottom is washi tape. I love how easy it is to add a little extra with just a strip of tape! Here is a look at the complete set. I love the sentiments included too! Are you wondering what prizes are up for grabs and how to win them? Two secret blogs in the hop this week will have a commenter who wins! So the more comments you leave, the better your chances are at winning! The prizes are: two 2 Cute Ink sets of your choice and another winner will win two Sugar Kissed Cottage sets (a NEW line from Lil' Inker Designs!) of their choice from the new release! That's a great prize! So to continue on with the fun, your next stop of the blog hop is over to Judith Gowdy's blog! Hello!! How are you all? Sorry for the LONG absence! I've started a new job, that will be part-time next week but for the last two weeks has been full-time. As I've adjusted to the schedule, I found I just didn't have enough time to sit and post! Hopefully that will change this next week as I begin a new part-time schedule! I have several cards that I made for this past Lil' Inker release that I still haven't shared with you, so I want to show you one today! The sun on this card is actually interactive in that I made it so that it can spin. That is kind of hard to demonstrate on a still photo, but you can see in the closeup how it is popped up. I attached some thin chipboard to the back side of the cardstock so that it would spin. A little bit of a fun element. Thank you for visiting today! I will have a post up on Tuesday for another new release from Lil' Inker, this time I'm posting with the Lil' Inker Color Team for a cute, cute new release that you won't want to miss!